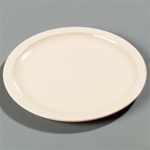 Dinnerware Plates from carlisle and World Tableware are quality plates for restaurants to serve lunch and dinner on. Wholesale Dinnerware China Plates from the Restaurant Supply superstore make your tabletop settings perfect for your restaurant guests. These fancy dining plates are dishwasher safe and durable for long life. They resist chipping and breaking during rough restaurant handling. World Tableware Princess Undecorated White Reusable Plate - 6.63 in. Carlisle Kingline 3 Compartment No Rim Plate 10 in. 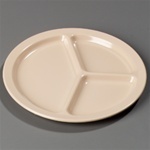 Carlisle Kingline Narrow Rim Dinner Plate Tan 9 in. 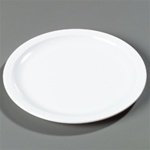 Carlisle Kingline Narrow Rim Dinner Plate White 9 in. Carlisle Kingline 3 Compartment Plate 8.72 in. Carlisle Kingline 3 Compartment Plate White 8.72 in. Carlisle Petal Mist Plate Clear 7.5 in. Carlisle Petal Mist Soup Salad Plate Clear 23.9 Oz. Buy Dinnerware Plates for your restaurants and other food service cafeterias and cafes that will stand up to heavy duty commercial environments. Only the best for your establishment patrons to eat off of.